In the age of automatic doors and smart devices, a doorman seems old-fashioned. The first and last people guests see, these iconic greeters continue to serve after decades while the question of the next generation of doormen hangs in the air. An increasing rarity in this age of self-check-in hotels, a doorman at a hotel lobby seems strangely old-fashioned and formal. For these beaming greeters, there is much more to their jobs than just tipping hats and opening doors. Their jobs are a mix of concierge and butler. They can call you a cab just as easily as they can give opinions on the best resturants. Sometimes, they manage crises resulting from drunken guests. Missing your shoes? Some of them will lend you a pair. Of course, lots of hotel guests choose to be self-sufficient, calling their own rides on car-hailing apps or Googling for good food in the area. But the doorman is a profession that epitomises the personal touch. In fact, some of the more long-serving doormen are becoming icons of hotels in their own right. Take, for example, Mr Narajan Singh, 62, senior doorman at Raffles Hotel Singapore, who was one of three finalists nominated globally for the Best Iconic Employee at the Worldwide Hospitality Awards 2017. Though he did not win, he has received numerous hospitality awards on behalf of the hotel on other occasions. It is also an ageing profession. Some doormen have stayed at their jobs for more than two or three decades. 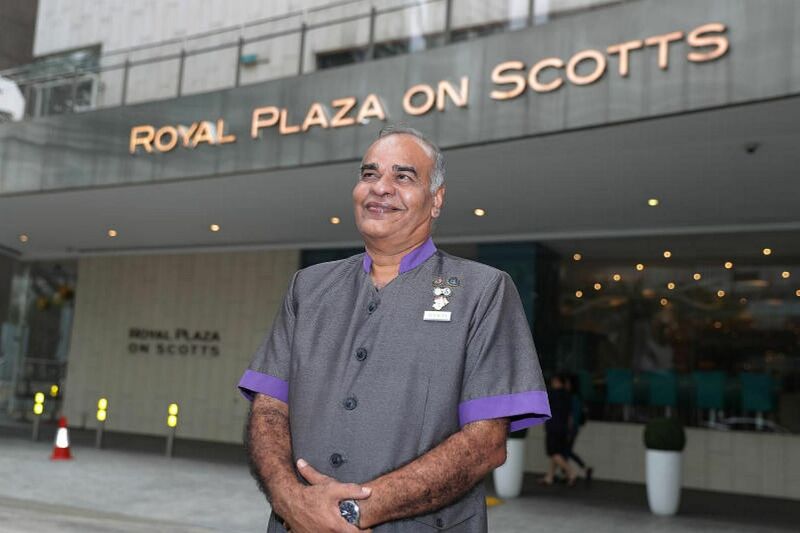 Singapore's longest-serving doorman, with more than 40 years of experience, is Mr Syed Kadir Syed Hameed, 63, who works at the Royal Plaza on Scotts. Asked about the struggle to find the next generation of doormen, Mr Singh says: "Today, the first question people ask is how much they will get paid or what the benefits are. "But in a job like this, you need to truly love what you do. Only then can you do it for years and with pride." You do not work 31 years as a doorman and have no funny stories to tell. Mr Ismail Buang, 71, who has been holding the fort at the lobby of the Fairmont Singapore, is full of anecdotes. Take, for example, the time when some airline crew had a little too much to drink and carted back a life-sized standee of Colonel Sanders from a nearby KFC outlet. "I had to distract them and get them back to their rooms so I could put the cutout in storage for someone from KFC to pick up the next day." Another time, he played tour guide to an elderly Australian couple and helped to push the wife, who uses a wheelchair, to places of interest in the vicinity. The couple were keen for him to go back to Australia with them because they were enamoured of how caring and patient he was. "Of course, I had to say no as my family is here," he says. He adds: "Still, I was touched by them and the fact that they have made the effort to stay in touch and mail me letters over the years." Full of jovial greetings and animated thumbs-ups, Mr Ismail has survived several management changes to the hotel over the years. He joined the year the hotel was formed, in 1986, when it was run by The Westin Stamford and Westin Plaza under Westin Hotels & Resorts. Since then, the property has changed hands various times and it is now managed by AccorHotels. Although he is now a fixture at the hotel, he actually considered quitting within the first two weeks on the job. Back then, he was 40 years old and newly retrenched from his previous job as a delivery man at food and beverage company F&N. "I was introverted and shy back then and the thought of speaking to strangers made me very nervous." Thankfully, a fellow doorman at the hotel took him under his wing and told him to follow his lead - teaching him how to approach and greet guests and pointing out important things that he should remember, such as directions. Today, he says he cannot imagine stopping what he is doing or retiring - even though he has to stand for more than nine hours a day. "As long as I am in good health, I'm happy to do my job. "To be in this line, you cannot be biased and treat some guests better than others because they are nicer. You must treat everyone equally. "I take a lot of pride in my job - it is a privilege to be able to make someone's day simply by greeting and wishing him well." 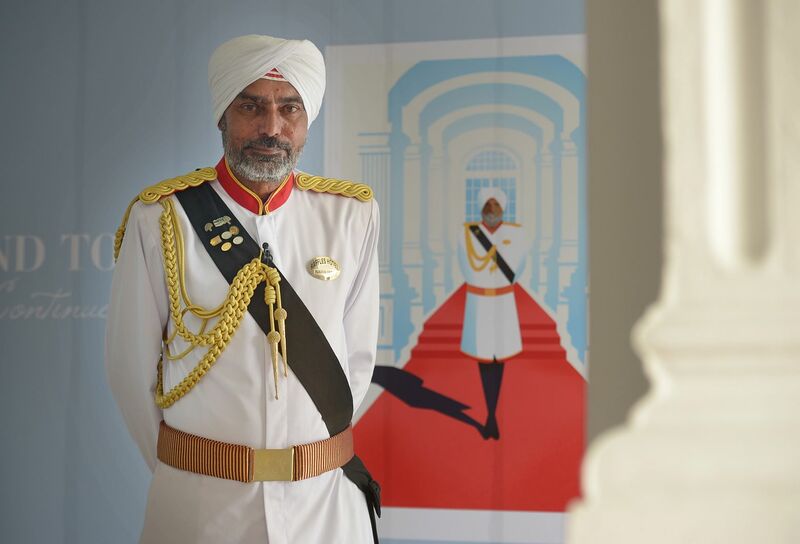 Senior doorman at Raffles Hotel Singapore, Mr Narajan Singh, 62, is nothing short of being an icon. A familiar sight on the gravel driveway of the Beach Road institution where he has worked for the past 26 years, he has even been immortalised in a painting of the hotel. The approximately 60cm by 120cm painting by a French-American artist, which is on sale in the hotel gift shop for $18,000, features Mr Singh surrounded by other iconic symbols of Singapore, such as the durian and the statue of Sir Stamford Raffles. Elsewhere in the shop, his likeness can be found on everything from plushies and stamps to T-shirts and aprons, many of which tourists have gotten him to sign over the years as a souvenir. Walking around the hotel with him is like accompanying a celebrity - he is constantly stopped by guests and passers-by who want a picture with him. For the burly Sikh and father of three, the responsibility that comes with wearing the Raffles doorman uniform is not one to be taken lightly. His white coat, turban and gloves are without a speck of dirt, his shoes are carefully polished daily to remove dust from the gravel driveway and his gold belt buckle shines to reflect the letters R.H engraved on it. "I've been here so long that people even recognise me when I don't have my uniform on," he says. "It's why I take a lot of pride in my job as an ambassador of the hotel. I've been so lucky to greet and interact with some amazing people over the years." That list includes royalty such as Queen Elizabeth and Prince William and celebrities such as singer Michael Jackson. He also interacted with the late senior minister Lee Kuan Yew on his yearly birthday celebrations at the hotel and had the honour of escorting him and pushing his wheelchair to the car during his last visit to the hotel before his death. Now a grandfather of five, Mr Singh joined Raffles Hotel after he lost his security guard job in the shipbuilding industry in 1991. He lives in Bukit Panjang with his wife. Raffles Hotel has two other doormen, who are brothers. Together with Mr Singh, they are the designated brand ambassadors who receive any awards given to the hotel. On behalf of the hotel, Mr Singh has flown to places such as Bangkok and Germany to receive these honours, starting back in 1994 when he flew to Las Vegas to receive the award for World's Best Independent Heritage Hotel. But the greatest sense of fulfilment comes from the relationship he has established with his guests. "Some guests call ahead to see whether I'll be working when they visit. There is a Japanese woman who lives in Singapore and she takes her son to the hotel every year to celebrate his birthday and take a picture with me," he says. "It's a great feeling that people go out of the way to stay in touch." "Forty years, two months and 27 days." Mr Syed Kadir Syed Hameed, doorman at Royal Plaza on Scotts, knows exactly how long it has been since he started his job. 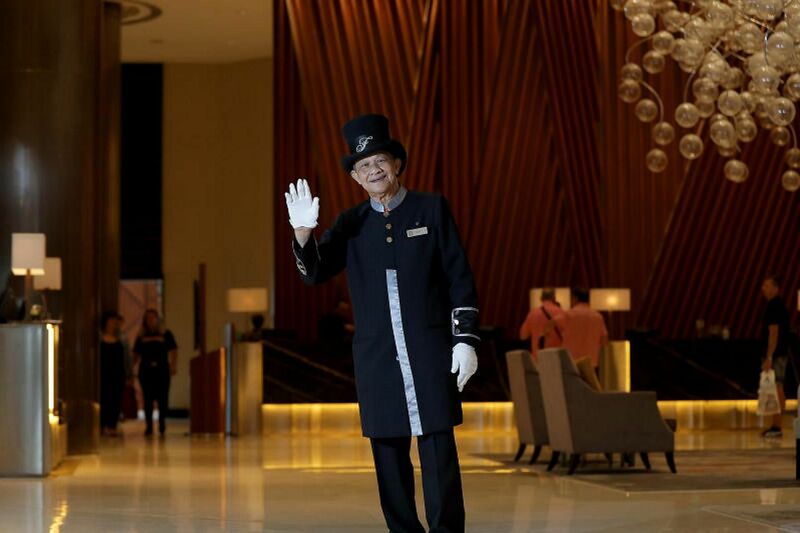 Over four decades and 12 uniform changes later, the 63-year-old now holds the title of Singapore's longest serving hotel doorman. "Working in this job is an honour," he says. "I get to speak to guests when they arrive and I'm the last to speak to them when they leave. "To be able to help people and make them feel happy is a great feeling. I am lucky my job is to make someone else's day better." A drawer at home full of cards and commendations from hotel guests over the years - "Thousands of them!" - attests to his good-natured and patient personality, a trait he says has been key in his excelling in his job. But it is more than just greeting guests or hailing taxis that sets him apart. He goes out of his way to help hotel guests. For example, to make overseas guests attending a wedding at the hotel feel welcome, he shares tips about where to eat and shop in the area. Once, he lent his shoes to a guest who had forgotten to pack a pair and found himself short on time to buy another pair before a meeting. His kindness extends to people not staying in the hotel too. On numerous occasions, he helped visually-disabled passers-by cross the road using the overhead bridge near the hotel lobby and to get onto their bus at the bus stop. Over the years, guests have shown their thanks in droves - not just through the commendations, but also through gifts, such as snacks and traditional sarongs. The silver Seiko watch he sports on his wrist is a gift from a couple who had their wedding at the hotel last year. "They were so grateful that I helped make their guests feel welcome," he says. "It was very kind of them to think of me." Mr Syed first worked as a cargo clerk at Paya Lebar Airport for a year before jumping at the opportunity to apply for the doorman position when he was 23. "I went for it because I had always wanted to work in hospitality. I am the outgoing sort so I wanted a job that lets me interact with people." The father of five and grandfather of seven lives in Bedok. His job is not always easy. His hours are long - his shift starts at 7am and ends at 4pm, six days a week - and there is the occasional difficult guest. "Not everyone is kind," he says. "But you have to brush these things off. The wonderful interactions are what make it all worth it." Correction note: In an earlier version of the story, Mr Narajan Singh's name was spelt as Mr Naranjan Singh. This has been corrected.